I guess I’m one of those lucky parents; my kids have always eaten broccoli. There possibly was some persuading in the beginning but I never had to hide it in their food, or tell them funny stories about eating their ‘trees’. It was, and still is, their most beloved vegetable. And although my interest in vegetables – of all tastes and flavours – is far greater than theirs, for me broccoli is a green I always want to see on my plate. Strangely enough, it’s comfort food. You are probably familiar with the concept of roasting cauliflower. Its green cousin, – broccoli -can be prepared in exactly the same manner. The florets are sliced into large pieces drizzled with olive oil, salt pepper, maybe a spice, maybe a herb, and roasted in the oven for about 30 minutes. After you’ve roasted a batch for this frittata, you really must roast another tray and serve it as a side dish on another occasion. We ate roasted broccoli with preserved lemon chicken and quinoa tabouleh a few nights ago and it was delicious. For this frittata I’ve thrown in whole cloves of garlic to roast. The cloves are then squeezed and the cooked garlic puree (which softens in flavour) is whisked into the egg mixture. It’s fabulous. Frittata is simple food. It’s dinner. It’s lunch. It’s even breakfast if you’re that way inclined. In fact, sandwiched between two pieces of bread it becomes picnic food too. Eggs are such an easy meal for any time of the day. I would be lost without them. 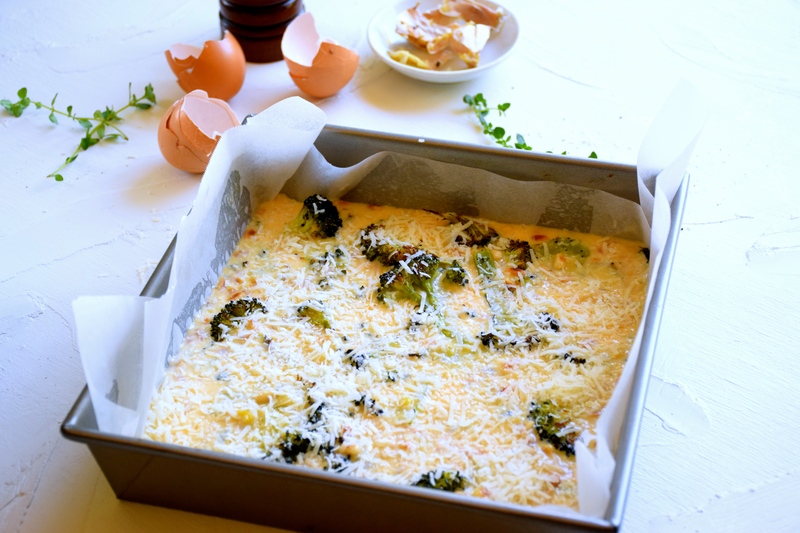 Slice the broccoli into1cm thick pieces and scatter it on a large tray (lined with baking paper if you wish). Sprinkle the broccoli with olive oil, chopped thyme, salt and pepper and whole cloves of garlic (skin and all). Roast in the oven for 30 minutes. Remove and set aside. Turn the oven down to 175C. When the garlic has cooled slightly squeeze it out of the cloves. Roughly chop it. In a medium sized bowl whisk together the eggs, chopped garlic, cream, salt and pepper. Line a 23cm square tin with baking paper. 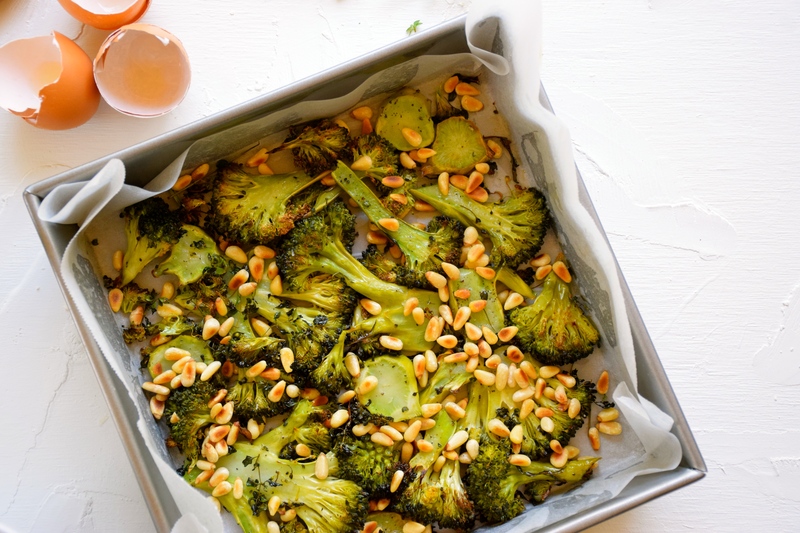 Place the broccoli into the base of the tin and scatter over the toasted pine nuts. Pour the egg mixture over the broccoli and top with grated parmesan. Bake in the oven for 25-30 minutes. Cut into pieces and serve warm or cold. 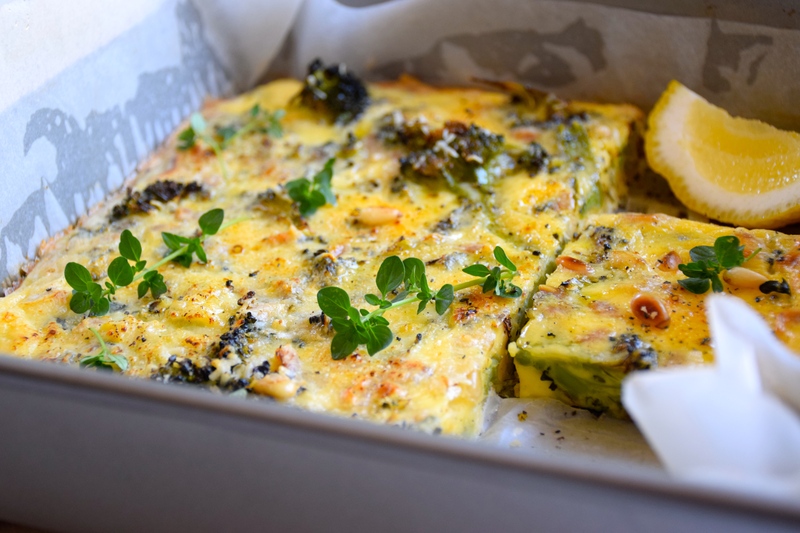 I love a good frittata and your idea of cooking it in a square pan is genius! So much easier for serving — and clean-up, too, I’d imagine. Indeed John. I’m rather addicted to lining trays with baking paper, it saves all that egg sticking to the pan. Anything to lessen the washing up! Thanks. I love that poached pear recipe with star anise on your blog, sounds delicious. What a wonderfully clean frittata. Great recipe! Will be a wonderful late Saturday breakfast. I had to refrain from adding a heap of goats cheese or feta, so as to keep it on the healthier side. You’re right though, it would make a wonderful breakfast. Ok, now I have to try roasting broccoli. We eat frittata at least once a week, usually to use up leftover cooked vegies. Love your flavour combo! Oh yes you must! You’ll find yourself roasting it with all manner of spices and herbs.